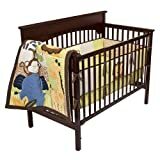 Product DescriptionBananafish Jungle Gym 4 pc Crib Set Bananafish Jungle Gym 4 pc Crib Set. Your favorite Jungle Friends are found in a combiantion of Textured Cotton fabrics. White and Heather Grey predominate with a hint of Red in the fancy embroidery details. Included are Waffle Knit, Fleece, and Corduroy. 36″ x 48″ reverses to a cotton Jersey Knit with allover Elephant Print. Includes Hanger Loops to use your comforter as a bold wall decoration. 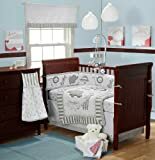 Crib Bumper in 4 pcs (158″ Total x 10″ Tall) includes the same Novelty Fabrics and Applique and Emboridery Details found on the comforter. Reverses to a Bold Heather Greay and White stripe. Cotton Knit Crib Skirt includes striped bottom fringe, and embroidery stitching. 100% Cotton jersey Crib Sheet includes the whimsical Elephant print found on the comforter.